Lush green rainforest settings, animals enjoying in their natural habitat and visitors getting all amazed watching these animals out in the wild – all at one place – The Singapore Zoo! It is one of the most visited attractions in Singapore and is increasingly becoming popular among Indian family holidaymakers.To enjoy a seamless journey, book a Singapore visa and experience Singapore like never before. Home to over 2,500 specimen from 316 species, the zoo attracts over 1.6 million visitors a year; Singapore Zoo is a must visit for every traveller. The natural barriers instead of bars make the wildlife experience more fun and natural for visitors and also provide comfort to the animals. Most of the animal habitats are incorporated with special viewing features making it more visitors and kids friendly. For instance, there are elevated platforms to view giraffes, underwater galleries to view water world animals and glass observatories to see predatory animals like lions and cheetahs. Moreover, you can also feed the kangaroos at the Australian Outback area. - Taxi: If you are looking for comfort or if there are more than 3 people travelling in your group, you should opt for a taxi. (Approximate cost SGD 15 from Orchard Road). 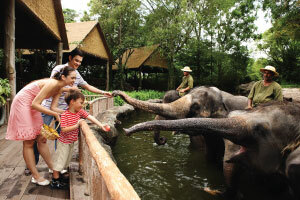 The Singapore Zoo, River Safari and the Night Safari experience – all are located in the same vicinity. So, it will be best if you allocate one full day dedicated to the wildlife experience in Singapore. Simply opt for the Park hopper special package to get the best deal on ticketing. 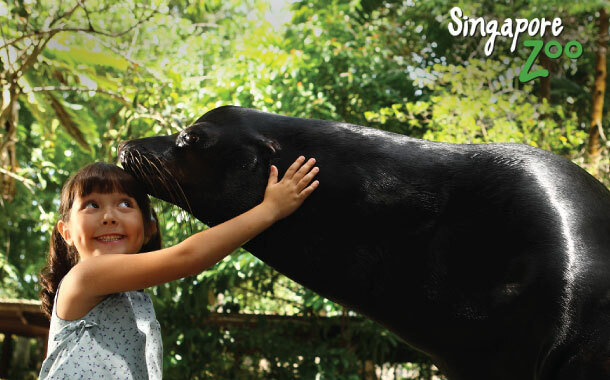 To start with, get the Singapore Zoo official app to plan your adventure beforehand. Otherwise, you can always get the zoo map from the ticketing counter and get assistance from the happy-to-help zoo assistants at the zoo. Since the Singapore Zoo is huge, we recommend you to wear your best walking shoes. However, if you are not than opt for a tram ticket (SGD 5 for adult and SGD 3 for kids) for unlimited rides around the zoo. The tram moves around the entire zoo and you can hop-on and hop-off at your preferred stations (for this you will need the zoo map beforehand). The protective barriers will keep you at a safe distance from animals such as zebras and elephants, but you can expect a number of amazing creatures to come right up to your tram as you travel. 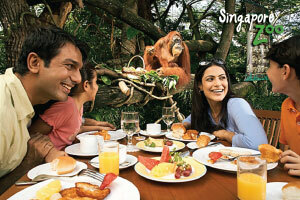 The Singapore Zoo is the only zoo in the world where you can have breakfast with orang-utans! At a minimal cost, we strongly recommend you to opt for this optional jungle breakfast to enjoy a delicious international buffet in the company of a fun-loving family of orang-utans. Get up and close with these hilarious animals. Don't miss the once-in-a-lifetime opportunity to photograph the orang-utans as they swing and climb in their naturalistic enclosure while you enjoy breakfast — an experience you'll never forget. Do check the schedule of the Singapore Zoo (visit their official website for the same) beforehand to enjoy all the shows, feeding times and exhibits. The Zoo has multiple interactive activities scheduled around the day like Splash Safari Show, Animal Friends Show, Elephants at Work & Play Show, Rainforest Fights Back Show along with Token Feeding time slots in morning and afternoon. - Do carry energy bars, insect repellent, sun block, hats and of course a camera (with extra batteries). - The zoo has good number of F&B outlets but if you are on a budget trip, eat before you arrive at the zoo. - If you forgot to carry drinking water, no worries! Just but a bottled drink (costing around SGD 3-5) and later refill it at drinking fountains available at multiple places across the zoo. - For special needs, there are wheelchairs available for free. - For infants and toddlers, there are strollers and wagons available on rent at minimal cost. Operating hours: Opens at 08:30 am and closes at 06:00pm.